Cycling opportunities in the Valley are growing, combining the best of the area’s food, wine, and scenery into a selection of man-powered packages. Let’s face it, cycling is less of a chore when you have a growler of local craft beer, fresh herbs, and a few pieces of fresh-picked produce in your basket. The mere sight of a cruiser bike rolling by can make anyone smile, whether it’s an old beater coming up main street, a colourful stand of identical wheels for rent while you’re on holiday, or the messy gaggle of bikes that often signifies a great pub night or backyard BBQ. Cycling is part of our Comox Valley culture, and fun isn’t limited to the myriad of technical trails that we have at our doorstep. Like coasting down a perfect countryside road, cycling tours are also gaining speed, allowing us to see our local farms and rural areas in a new light. Some of Island Joy Ride’s most popular tours are the “Chef on a Bike” summer series, giving riders a chance to experience the farm-to-table approach to dining, while exploring the local area accompanied by a chef that is intimate with local offerings and flavours. This year’s series include tours featuring “route beer,” “forage and feast,” and “vegan and vino”. Day tours include everything needed to get around: bikes, helmets, water bottles, snacks, and even sunscreen. Dress for the weather and be ready for fun. Island Joy Rides also offers fully organized, five to six-day self-guided travel packages for those keen to go further afield. Carefully designed routes , start in the Comox Valley and making their way up to Campbell River and Quadra Island, with luggage transfers, hotels, and suggestions for best stops. “These tours combine the freedom of traveling on your own with meticulously planned routes and behind-the-scenes support,” says Cronk. 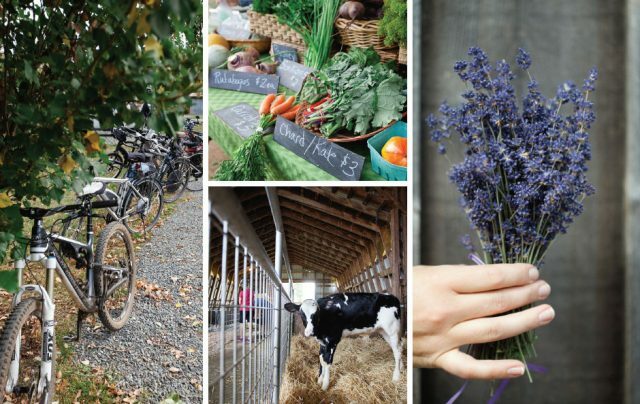 Celebrate the seasonal bounties of the Valley at the 8th annual Comox Valley Farm Cycle Tour, taking place on Sunday, September 23. The tour is accessible to cyclists of all ages and skill levels, and encourages riders to create their own adventure by selecting their route and exploring the countryside. Pick the stops you’d like to make, then go at your own pace. Last year, participating farms and growers included Blue Moon Winery and Ciderworx, Berry Best Organic Farm, Amara Farm, Courtenay Country Market, Gladstone Brewing Co., and Kehler Vegetable Co., just to name a few. Your pit stops offer local product tastings, farm tours, demonstrations, and more. Whether you’re a local or a visitor, it’s easy to explore the Comox Valley by bike. If you’re a mountain biker, your first stop will undoubtedly be the extensive trail network near Cumberland (if you’re new to the area, the enthusiastic crew at Dodge City Cycles can get you started). Cruisers can explore the farm and vineyard areas north of Courtenay, take a rip down the Old Island Highway with a stop at the Kingfisher Oceanside Resort & Spa, or pedal the paved Courtenay Riverway for a waterfront experience, ending at Locals Restaurant for a bite to eat. No matter where you roam, baskets are of course optional, but they undoubtedly make the bounty of the Valley much easier to hold.